Edit, convert, and compare PDFs and scans with all-in-one software. Find differences in text between two document versions – eliminating time-consuming line-by-line matching. 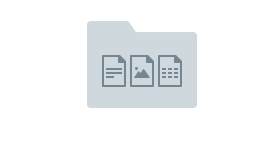 Compare Documents feature identifies changes between document versions in different file formats – e.g. a PDF of a scanned paper and its original Word version. Forget time-consuming line-by-line matching of text in paper documents or scans. FineReader lets you detect differences in text between two versions of the same document within seconds. It's so intuitive that you can use it productively right away - just point, click and compare. Compare text from two versions of a document across different file formats - Microsoft Office files, “digital-born” PDFs, scanned PDFs, paper scans, and image files. 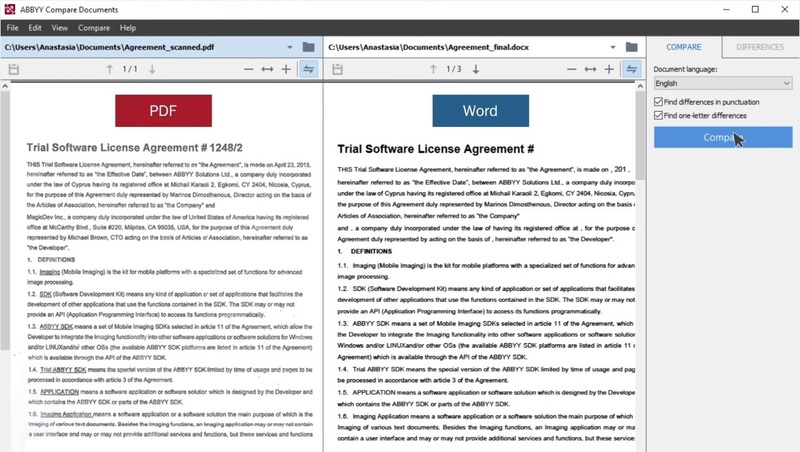 For example, you can easily compare the final version of a contract in Word with the scanned copy that your partner sent back signed. You can also compare two documents of the same type – for instance when you want to compare two PDFs. FineReader supports text comparison in 35 languages, including documents written in several languages. 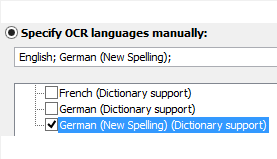 The software can also detect a document’s language automatically. Intuitive navigation and notification of identified changes make finding changes easy and eliminates the need for line-by-line comparison. Changes are highlighted in the compared documents and displayed side by side when scrolling, making them easily noticed when reviewing. FineReader excludes irrelevant changes and differences in formatting (layout, formatting, spaces, etc.) while keeping the validity of the document. Only those changes that affect content meaning are highlighted. 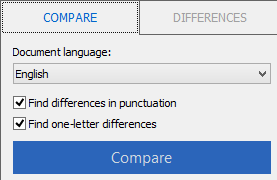 Results of comparison can be saved either as a PDF with changes marked as comments, or as a Word document that displays a “differences” report. Insignificant differences can be ignored and removed from a report before finalizing it. 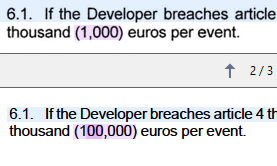 When you compare two documents, simply copy any change found directly from FineReader’s Compare Documents and paste anywhere you want to (e.g. email, messaging application, etc.) for more effective collaboration.